‘Embedded C’ is a popular ‘teach yourself’ introduction to programming embedded systems using first-generation TimeTtriggered (TT) software architectures. The ‘EC’ book package includes a hardware simulator: there is no need to purchase an evaluation board. ‘EC’ is widely available (Amazon.com, Amazon.co.uk, etc) at low cost. Pont, M.J.(2002) “Embedded C”, Addison-Wesley. ISBN: 0-201-79523-X. Pont, M.J.(2003) “Embedded C”, Chinese Electric Power Press. ISBN: 7-5083-1814-5. 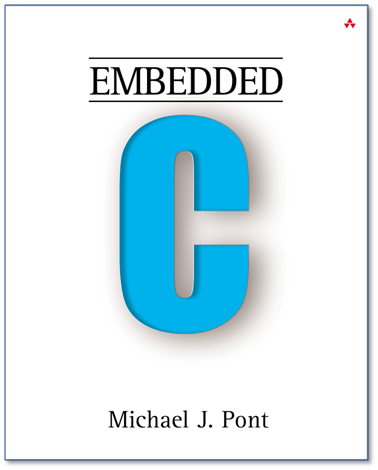 Pont, M.J.(2004) “Embedded C”, Pearson Education Taiwan. ISBN: 986-7491-52-1. Pont, M.J.(2008) “Embedded C”, Dorling Kindersley (India) Pvt. Ltd. ISBN: 978-81-317-1589-5. Use of embedded processors in passenger cars, mobile phones, medical medical equipment, aerospace systems and defence systems is widespread, and even everyday domestic appliances such as dish washers, televisions, washing machines and video recorders now include at least one such device. There is a large – and growing – international demand for programmers with ‘embedded’ skills, and many desktop developers are starting to move into this important area. Because most embedded projects have severe cost constraints, they tend to use low-cost processors with limited resources (e.g. 256 bytes of RAM, and CPU performance 1000 times less than that of a typical desktop processor). Using these limited resources, developers need to ensure reliable behaviour. As a result, developing embedded software presents significant new challenges, even for experienced “desktop” programmers. If you have some programming experience — in C, C++ or Java — then Embedded C and its accompanying CD will help you move into the embedded world as quickly and painlessly as possible. Covers key techniques required in all embedded systems in detail, including the control of port pins and the reading of switches. Presents a complete embedded operating system which uses less than 1% of the available processor power of an embedded 8051 microcontroller. Covers the microcontroller serial interface, which is widely used for debugging embedded systems, as well as for system maintenance and in data acquisition applications. Includes a substantial and realistic case study. Uses 100% C code: no knowledge of assembly language is needed. A C compiler is also included on the CD, along with copies of the source code from the book. Programmers with experience of Java, C++ or C on a desktop PC or workstation will therefore be able to get up and running very quickly. Includes a hardware simulator for the 8051 microcontroller on CD, so that you can try out all of the examples in the book — and create new examples of your own — without needing to purchase any hardware. If you are about to write your first embedded program — or have been struggling to learn about this important area — this book will save you weeks of effort. Copies of the code examples from Embedded C are available for download here (zip file). If you wish to use Embedded C in a university or college course, a complete set of Powerpoint slides (10 files, zipped) is available. These would be suitable for use in an introductory course on embedded systems. These files were created by Dr. Jimmy To, a faculty member at the Hong Kong Polytechnic University. If you spend a few minutes on Google, you will find a PDF copy of ‘Embedded C’. There are no legal PDF copies of Embedded C. If you have downloaded a PDF version, you have an illegal copy. This includes any and all PDF versions that are released by universities and colleges (there are no legal PDF copies). If you are using an illegal PDF copy of ‘Embedded C’, we ask that you either purchase a legal copy of the book (e.g. from Amazon.com), or make a donation of £3.00 to our PayPal account.